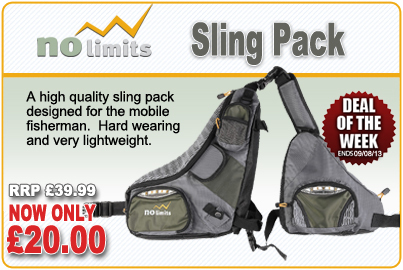 Deal of the Week is the No Limits Sling Pack with an RRP of £39.99, now only £20.00! Ideal for the angler who likes to travel light and stay mobile, the No Limits Sling Pack with its enormous capacity is lightweight and has plenty of room for all your bankside essentials. It saves lugging a big tackle bag around, has a robust strap system and comes with many compartments for line, hooks, terminal tackle, mobile phone and more!! Grab yours today while stocks last.